16 graduates of the 12-month Unemployed Youth Assistance Programme (UYAP) have been awarded bursaries by the Wholesale and Retail SETA (W&R SETA) to study towards a national diploma in retail business management at the University of Johannesburg (UJ). Undertaken by retail training provider, Retail Relate, the UYAP consisted of comprehensive training in retail management as well as 12-month internships at leading retailers The Essential Hardware Group, AutoZone, Hoxies Foods and TWK stores. The 16 new UJ students are part of a group of 160 young adults, all of whom come from the informal and rural areas of Gauteng, who graduated from the UYAP last year with NQF 5 qualifications in retail management. The qualifications and experience they earned during that programme ensured that most of the graduates secured jobs shortly after completing their internships. This is in sharp contrast to their prospects two years ago when after completing their matric, these young people faced a daily battle with uncertainty and fear for the future. While their excellent matric results qualified them for tertiary studies, difficult financial conditions at home ruled out this possibility. Their lack of qualifications and experience also prevented them from finding jobs. 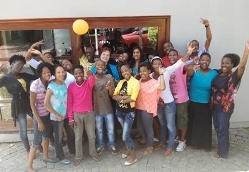 Head of UJ’s Retail Management Faculty, Mariette Frazer is delighted with the arrival of the new recruits. “Having the year’s internship under their belts, and the thorough training from Retail Relate, including the life skills components, these youngsters are more than ready to tackle first year university,” she said. One of the 16 UJ students, Rayvin Daniels from Reiger Park, a township located east of Johannesburg, achieved matric results that earned him a place among the top six learners in his school, Reiger Park Secondary. But coming from an unemployed single parent household, with no one to fund tertiary studies and months of unsuccessful job hunting, he was ready to give up. When recruited into the UYAP by Retail Relate, he grabbed the opportunity with both hands, graduating as one of the top 10 learners and even serving as a mentor for Retail Relate’s Rural Youth Project (RYP) after he graduated. “I am absolutely over the moon about this chance to study at university, it was always my dream to do so and now Retail Relate and the W&R SETA have made it a reality,” he said. Upon graduating from UJ with his national diploma, one of Daniels’ dreams is to become the marketing director of a large corporation. Like Daniels, Thandiswa Madlolo from Rondebult, another low-income area east of Johannesburg, also excelled at school. She obtained university exemption but financial constraints ruled out the possibility of tertiary training and she was at a loss when it came to choosing a career. The monthly stipend of R2 000 – provided by the W&R SETA – earned during her UYAP internship helped her to make ends meet, while the work experience and the theoretical training helped her to decide to pursue a career in logistics. This is one of at least 67 career paths existing in the retail sector. The 16 students will continue to gain workplace experience during their studies through Foschini Group, another of Retail Relate’s retail partners, which has agreed to provide them with vacation jobs.